Double-Decker train, Buy Double-Decker train tickets online quickly and easily. Double-decker trains were presented in Russia on the 1st of November on Moscow - Adler route. 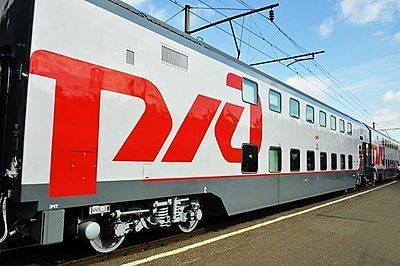 Starting from the 1st of February 2015 they operate on Moscow - St.Petersburg route. The train makes only 2 stops on its way covers the distanse in 8 hours. This trains offer high quality at affordable price. Only 2nd class carriages are available. Each carriage has AC and heating system maintaining a comfortable temperature, 3 WC, hot drinking water boile, CCTV safety system. There are 8 compartments per each deck of the train. 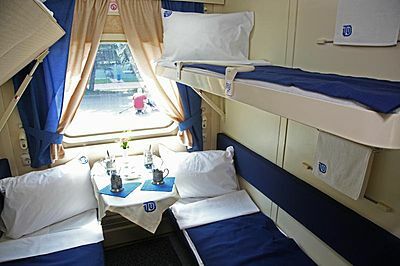 Each cabin has 4 sleeping berths (2 upper and 2 lower ones), a table, a mirror, storage for small neseccities placed above each berth, two 220V sockets, individual lamps and stairs for getting on the upper berths. Storage below the lower berth has enough space for 2 big suitcases. Each carrige can board 64 passengers (instead of regular carriages for 32 people), which helps to lower the ticket price. 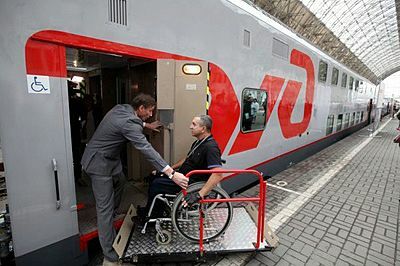 There is a staff car with a compartment equipped specially for disabled passengers and those who accompany them. The train also has a restaurant car. Travelling by this train you can enjoy a high comfort at affordable price. Electronic tickets are available in this train. Ticket sales for this train open 60 days prior to the trip. The train is included in the system of dynamic pricing, which means that you get the best price if making the booking at early stages. I'm back from my trip to Russia and would like to say thank you again for your incredible service and support. I'll certainly recommend Express to Russia whenever I have the opportunity to. Большое спасибо. Thank you very much, Express to Russia , for your perfect service in getting me my invitation, voucher and TransSib tickets. No stress whatsoever!